Join me on my new site, House of Maniaks! Cut the sausage in half lengthwise and slice thinly. Brown the sausage in a 7-quart Dutch oven over medium-low heat, approximately 15 minutes. Remove the kielbasa from the pan and set aside. Add the oil and garlic to the pot with the sausage drippings and cook for 1 to 2 minutes, stirring constantly to prevent the garlic from burning. Add the broth, beans, and potatoes. Cover and bring to a boil, stirring occasionally. Note: I let the soup simmer for over an hour, so I needed to add about 4 cups of water to make up for what had boiled off. Add the pasta and cook according to package directions, until pasta is tender. Add the sausage back to the pot. Add the red wine vinegar and black pepper and stir to combine. Ladle the soup into bowls and serve hot. My family added sriracha hot sauce to their bowls to make it spicy! Dino has memorized the books of the New Testament and is working on the Old Testament now. Each day, we discuss a book of the Bible and point out the highlights of that book - the author, the theme of the book, and the key characters and stories. Dino creates a flash card for each book, which he uses to practice putting the books in order. I would like to start memorizing scripture as a family. We are going to start with what Dino's Sunday School class is studying - Hebrews 11:1 and 11:6. We started the year using a book called The Life of Fred, which appealed to me because of the incorporation of other topics into each lesson. While this curriculum appeals to children who love to read but aren't too fond of math. Unfortunately, Dino is just the opposite, and it was immediately frustrating for him to read so much and have so little math to work on. Dino does much better just learning one math concept at a time, so we abandoned Fred in favor of worksheets printed out from a couple of different websites. He worked up to 3-line addition, 6-or-more-digit addition and subtraction, carrying and borrowing, time telling, word problems, basic fractions, and measuring using a ruler. We are now starting to introduce multiplication. Dino understands the concept of multiplication as iterative addition, so next I want him to memorize the multiplication tables. Dino has started learning about the United States of America. He is learning to identify each state's location on the map, and he is memorizing the 2-character postal code for each state. We work on 3 or 4 states at a time, 2 days for each group. We are not using any particular lesson plan for science, but rather grabbing opportunities as they come along. The local homeschoolers organized a field trip to the Department of Public Works, where they discussed water conservation. We read a book together about the life cycle of frogs. We read a book about fire safety and used a candle to demonstrate what elements fire needs to burn. He read an articles on push and pull forces, how things move, and the pitch and volume of sound. He has also read an article in a National Geographic book on wolves and another on dogs vs. cats. Dino read an article on land use (rural/urban/suburban), and we discussed the election last week and how individuals are voted into local and state government. We are using and loving Sonlight's Sequential Spelling curriculum. Instead of memorizing lists of spelling words, Dino is learning the logic behind how words are formed and is seeing the patterns in lists of words. The curriculum is set up so that he has a list of 25 words each day. I say the word, use it in a sentence if needed, and he does his best to write down how he thinks it is spelled. I tell him the correct spelling, and he corrects his paper if needed. We also discuss the homophones of words as they come up (when words have different meanings but sound the same, like thrown and throne). Each day's word list builds on the day before in an 8-day cycle. For example, day 1 might have the word bat, then day 2 will have bats, then batted, then batting, and so on. Dino is reinforcing some things he learned in first grade - ABC order, homophones, synonyms, antonyms, nouns, proper nouns, etc. We are using worksheets from a book I found at Sam's Club called Comprehensive Curriculum of Basic Skills. I expect us to get through the Grade 2 book by the end of the calendar year and go through the Grade 3 book next semester. Dino loves the Magic Tree House books and has gone through 4 of them this school year, reading about 1 chapter a day. He took a break from them recently to read a few short story books. I try to read a chapter a day to him from another book. We finished The Jungle Book and are working our way through a young reader's adapted version of Alice in Wonderland. We are also using the Comprehensive Curriculum worksheets for Reading Comprehension. Dino *hates* these because he actually has to think to get his work done! He has been doing sequencing (putting steps in order), identifying same/different details about 2 characters in a story, reading for details, and following directions. Like English, I hope to be able to go through Grade 2 and 3 concepts this school year. So far, Dino has learned 13 lowercase letters, so he is halfway through the alphabet! He is very detailed, so he tries hard to keep his writing neat and slanted. Dino has a few hours almost every afternoon to run around with his friends when they're done with their school, so he is well-exercised! We go for walks together around the block to get our dogs some exercise, too. We follow the local school's schedule for breaks and holidays, so that Dino gets the same days off as his friends. We did make an exception for fall break, however. We took a week-long vacation with family that didn't line up with the local school's fall break. We gave Dino the option of doing school on vacation so that he would have the same days off as the neighbors, or taking our break on vacation then just push through and try to get school done a little early on the friend's day off at home. He wisely chose the latter. We don't have any particular art plan, but do things as they come up - some English/Reading assignments involve drawing pictures or coloring, he cuts and glues his Bible flash card every day, we make geography flash cards, and we recently made salt dough Christmas ornaments using a recipe on a Reading Comprehension assignment for following directions! In first grade, Dino's goal in reading was to find a book in the library each week with the fewest words as possible. He has made a huge turnaround in the past 3 months, finding books that he actually enjoys reading, and declaring that he *loves* to read! That, if nothing else, is a huge success in my book! I used leftover mashed potatoes to make these fried potato patties. Heat oil and butter in a wide skillet on Medium heat. Put the flour in a bowl or pie pan. Combine mashed potatoes with the egg and any add-ins. Scoop out 1/4 cup of the mixture, shape into a patty, and dredge both sides in flour. Fry for 5 minutes on each side, or until golden brown. Remove to wire rack to drain and season immediately with salt and pepper. NOTE: Optional add-ins could include any combination of the following: 1/4 cup corn, 2 Tbs. diced onion, 1/2 cup shredded cheese, 2 tsp. dried chives, 2 Tbs. bacon bits, etc. I added in leftovers that I had on hand - corn and diced onion. This meatloaf was a hit with both Tim and Dino! Combine all the meatloaf ingredients in a large mixing bowl. Do not over-work the mixture. Transfer to a greased loaf pan and smooth out the top. Place in preheated oven and bake for 30 minutes. Remove from the oven after a total of 1 hour of baking. Cool slightly, slice, and serve! We ate our meatloaf with green beans, potatoes, and rolls. These cookies are loaded with Graham Cracker crumbs, chocolate, and marshmallows! Note: To make graham cracker crumbs, place graham crackers into a large zip-top plastic bag, and use a rolling pin to crush crackers into fine crumbs. Mix together graham cracker crumbs, flour, and baking powder in a bowl. In another mixing bowl, beat butter and sweetened condensed milk until smooth. Stir in vanilla extract. Add crumb mixture and stir until smooth. Fold in chocolate chunks/chips. 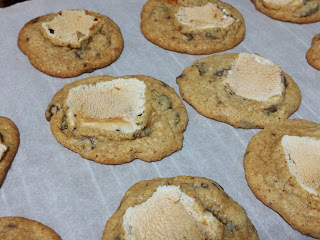 Drop by teaspoonfuls onto a lightly greased cookie sheet, and lightly press a marshmallow piece on top of each. Bake 12 minutes, or until lightly browned and the marshmallow is puffy and toasted. Let cool for 5 minutes, then transfer cookies to a wire rack to cool completely. I have very few memories of elementary school. I remember sitting at round tables in Kindergarten, with gigantic tri-fold cardboard dividers around our tests at the end of the year. I remember my Kindergarten teacher making green eggs and ham on a hot plate in our classroom. And I remember running in the field outside for recess, with the boys labeling every hole in the grass a "booby trap" and being appalled that the teachers let them say a bad word! Ha! In 1st grade, I remember getting gigantic pink plastic-frame glasses, and I remember sitting on carpet squares in the front of my classroom to listen to Mrs. Duvall read James and the Giant Peach. I don't remember 2nd grade at all. My mom said we did a lot of worksheets that year, and not much else, so it's no wonder. My 3rd grade teacher was amazing. Mrs. Goodwin had class pets - a hamster that we could pass around in a container to pet, and an aquarium with a sea anemone! She would roll in the tall TV cart for us to watch episodes of Fat Albert and let us draw on long strips of paper. I remember doing Sweatin' to the Oldies videos in the gym for PE. Before winter break, we did a class play in which I was one of 3 kittens who had lost our mittens. We wore footie pajamas (blue, pink, and yellow - I probably picked pink) and my mom made cat ears out of matching colored felt and plastic headbands. I started private school in 4th grade, and I have a lot of school memories from then on out. Not one of those early memories has anything to do with the theme or decorations in the teacher's classroom, or homework assignments, or grades. I am sure they were there, and I am sure they enhanced the experience, but they were not the focus.